One of those movies where nothing terribly exciting or interesting happens, this is a biking race movie where the characters and story are just not that interesting. This is a very average movie. it’s about a group of teenagers, yet only really gives a story to one of them. That story has him do all of the typical things you would find in a movie like this. He enters a competition, hangs out with his friends, and develops a crush on a girl. The problem is that none of these situations is very original or interesting. If the other characters got a little bit of development, it might have led to something. As it is, this movie is very ordinary, and offers nothing new to the highschool-college kids genre. 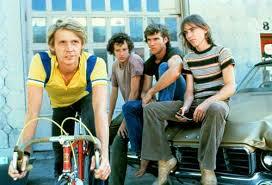 Breaking Away is a biking movie from the seventies. It’s from a time where movies about young people in high school were much more innocent and family friendly then they are today. At the same time, what that also means is that they were a lot less interesting. In the eighties it was about romance, with john Hughes films. In the nineties and early two thousands we started getting extreme circumstances from American pie to superbad. But back in the seventies, the most we got from high school movies was sports competition. That’s what this movie is. It’s about a biker and his friends. The competition itself is hardly a big deal, since it only comes at the end, and doesn’t have a whole lot leading up to it. There’s no real training, throughout the film, for example. This isn’t a movie about a race, but about a kid and his friends. That’s a fine idea for telling a story, because if the friends and the situations they get involved in are fun then the movie can easily work. In this movie, however, those things are not handled correctly. There are two main problems with the movie. Lack of character and lack of story. The main character is a kid named Dave. This kid has a little bit of story to him. He’s part of a group of kids called cutters. It means kids from the wrong side of the tracks. Not that there’s anything terrible in their lives, it’s just that the other kids their age all seem to be upper class jocks from well to do families. The cutters come from working class families. The movie is about the four kids in this group who have graduated from high school and are now starting their summer. None of them is to certain of what they want to do with themselves. None of them is setup to begin college in the fall, or even has a job. No wonder these kids are called cutters (it probably refers to these kids as the ones who would often cut school.) if more time was devoted to the situation of each kid and his potential ideas for the future, and what he was thinking, this could have been a pretty interesting film. The big problem is that other than Dave, none of the characters are really developed in any way at all. The four characters are Dave, moocher (Jackie Earle Haley), Cyril (Daniel stern), and mike (Dennis Quaid). Other than Dave, the only character that is given any sort of a story at all is Moocher. His situation is that he’s short, people make fun of him for being that way a lot, he has a hard time with it, he wants to find a job, and he has a girl who he is in love with who loves him back. Other than that, it’s all Dave. What we learn about Cyril and Mike is minimal at best. We know that Cyril is the goofy friend and mike is the tough guy friend who has been through some things that have made him very angry and jaded with the world. We never get any answers about what those things are. With Dave, it’s a different story. He’s the carefree, easy-going idealist. Dave is the dreamer of the group. The rest of them are more down to earth, but also more negative. Dave is the character who is actually fleshed out with different ideas and storylines. He is obsessed with Italy and the Italian language. All that really means is that he goes around saying basic Italian words like “chow bella” and “Bo journo.” Dave lives at home with his parents as has lots of humorous interaction with his father. Dave’s dad can’t stand the Italian obsession and constantly talks bad about his son to his wife. He considers Dave and his friends to be no good slackers who need to go out and get a job. Other than Dave’s home life, and the times he hangs out with his friends, Dave’s storyline involves a crush he has on a college girl. Dave rides his bike around and sees her walking on campus one day. She drops a book and he grabs it and then bikes around looking for her, to return it. When Dave does get to talking with this girl, Katherine, he pretends that he is Italian. He does a full accent and everything and makes up a whole story about himself. The problem is, the movie is very unfocussed. It’s not so much about this crush Dave has and the secret he’s keeping, or about his relationship with his father and getting a job, or even about his friendships with the other cutters. Instead, the movie is kind of all over the place. It’s like a Robert Altman film applied to just one character. Now, on the one hand, it’s nice to see a movie that diversifies its storyline and has all different things happening to the character at once. On the other hand, those situations have to be interesting. In this movie, a vast majority of them are nothing special. There aren’t a whole lot of great scenes or moments in breaking away, and that’s a big part of the problem. The most memorable scene might be when Dave and Cyril show up at Katherine’s window and start serenading her with a song, Romeo and Juliet style. This movie would have been far better if the other characters, besides Dave, got real storylines or personalities of their own. This movie won best screenplay of the year and was also nominated for best picture, back in 1979. That’s kind of hard to imagine. The only thing good about it is that it really shows how far we have come. 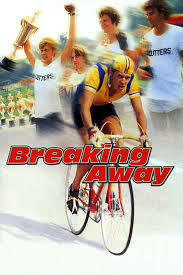 Breaking away is a very average and generic film. It wouldn’t be considered much of anything today. Back in the seventies when there hadn’t been many movies about young people yet, this film found it’s audience.